Steven (Chicagoland, United States) on 25 August 2014 in Architecture and Portfolio. Nice framing and light. Like its simplicity. You were smart to come early. That is a gorgeous interior that seems to be impeccably maintained. The exposure is perfect. Wonderful light and colors. A gorgeous image! This church has such a rich history. Amazing that it was not destroyed by the fire. A beautiful church! Wonderful framing and perspective! Quel intérieur d'église ce graphisme de bancs tout cette lumière superbe. That is beautifully shot. What a magnificent windows. We used to go to Mass there during our lunch break, when I used to work around the next block from there. Beautifully captured! Beautiful clarity and love this eye catching perspective. I like this view! it's such a new point for me! thanks! Wonderful shot of the magnificent church ! Very beautiful and the sacred mood. 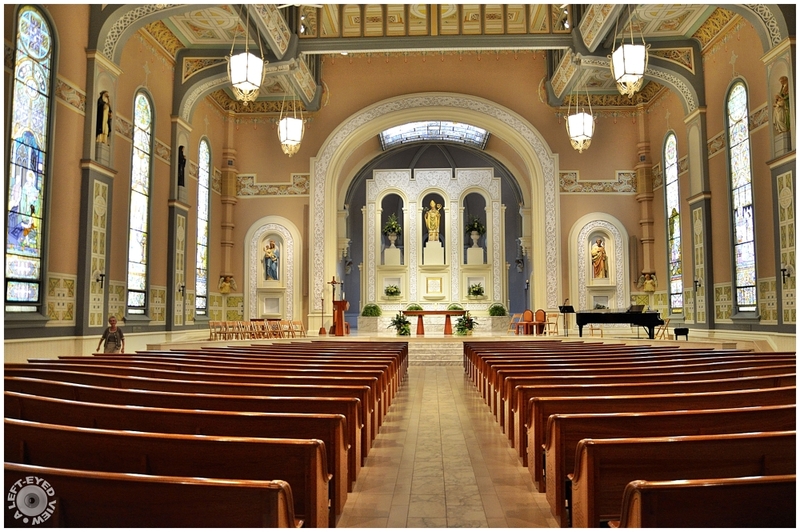 A fine shot of this church's formal looking sanctuary. Well done. Nice composition guiding the eyes through the banks to the altar.